According to a recent Administrative Notice (AN4557) sent out by USDA, starting October 1, 2011 the upfront guarantee fee will be reduced from 3.5% of the loan amount to 2% with the addition of minimal monthly mortgage insurance on all purchase transactions with the USDA No Money Down Mortgage. On a refinance transactions involving USDA Mortgages, the upfront guarantee fee will remain at 1% of the loan amount but will include the monthly mortgage insurance. The annual fee (divided by 12 months gives you the monthly mortgage insurance fee) and upfront guarantee fee are subject to change annually to maintain a subsidy neutral program. What does “to maintain a subsidy neutral program” mean? 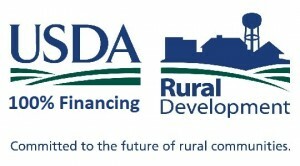 It means the USDA program is trying to model it’s self after the FHA and VA programs which are self sustaining/self funded and do not require congressional approval for funding. This is great news for tax payers in general but not so much for the potential new home buyer and here’s why. As you see from the example below, the new monthly mortgage insurance will increase your monthly payment which in turn effects your debt to income ratio. Your debt to income ratio is one of the primary factors looked at when an underwriter determines your eligibility for any mortgage and USDA Mortgages have some semi-restrictive debt to income guidelines. The other down side here is that the monthly mortgage insurance will NEVER go away! Unlike FHA Mortgages or even Conventional Mortgages, the USDA Mortgage will require the monthly mortgage insurance for the entire life of the loan. This will pretty much ensure that you will want to refinance out of your USDA Mortgage and into a Conventional Mortgage without mortgage insurance as soon as you have enough equity in your home. Key Financial Mortgage of Ky (NMLS# 1800) is not affiliated nor a part of the USDA Government Agency.